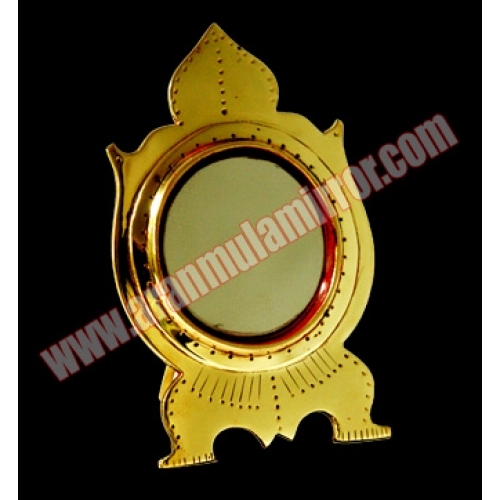 This model of aranmula mirror is known as the keerthi mirror. It is ideal for giving a gift or keeping at home.It believes that keeping this mirror in home will bring fame to you.so normally the politicians, musicians and artists are the biggest chunk of customers for this particular model. because of its small shape, you can keep it you, in your travel bags while you are traveling also. It has a mirror with water round shape, and the frame is made out of fine brass and lots of handmade works on it. the handle part is also decorated with works and ideal for giving wedding/housewarming/corporate gifts It has a stand in the back side of the mirror, it helps to place it any surface.It has a adjustable back stand.